The car was not too badly damaged following the off on the Galloway Hills in September. A new wing was needed and the suspension arms were replaced but apart from that it all looked fine. Until the Sunday before Wales when the car wouldn’t start. Gordon replaced everything he could think of, leads, coils etc. but no difference. The car was booked in with ProTec Performance to get the carbs tuned prior to heading to Wales so Gordon agreed to drop the car off a day early so that this problem could be investigated. The laptop suggested everything was working ok but still it wouldn’t start. The problem was finally traced to the crank shaft sensor bracket which had broken and the locating pin that prevents the sensor from moving was missing from the end of the bracket. Once a new sensor bracket was fitted the car started straight away. 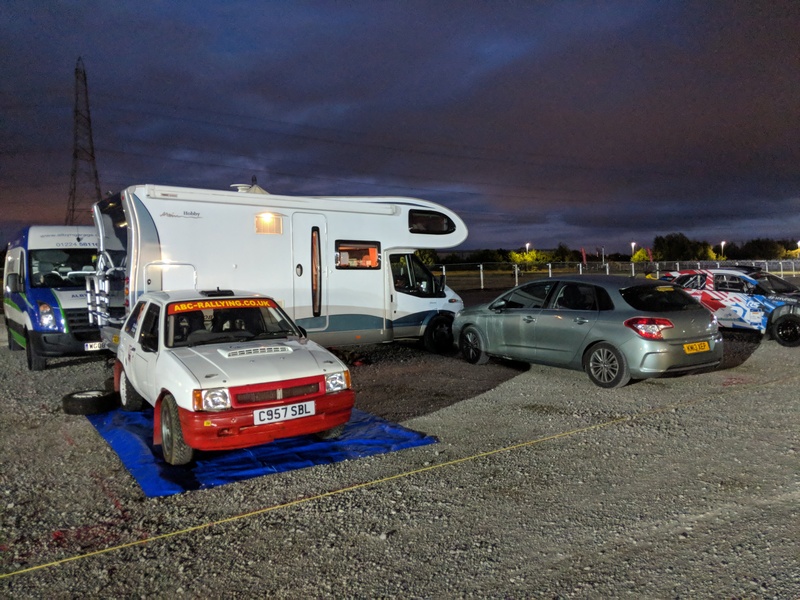 The car was picked up on Wednesday night and we headed to the service park at Deeside in North Wales. Thursday was the day to get the car checked at scrutineering and to complete the paperwork. Everything went smoothly with no problems. The rally started for us on Friday. 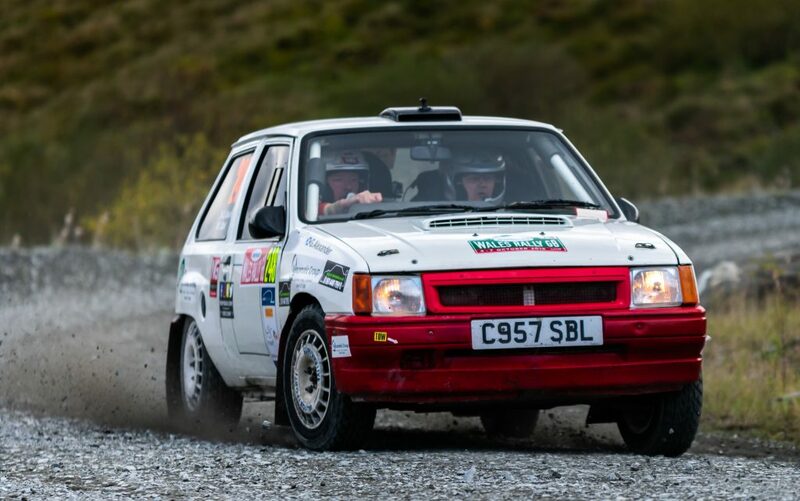 There were six stages across North Wales. The first, Clocaenog went fine. No dramas and we got up to speed quite quickly getting used to the slippy surface. Next up was Brenig which was the longest stage of the rally at 18 miles. It started fine but unfortunately quite early on we noticed some handling problems. This got worse and it became clear that we had a puncture. We still had about 8 miles to go so had no choice but to stop and change it. 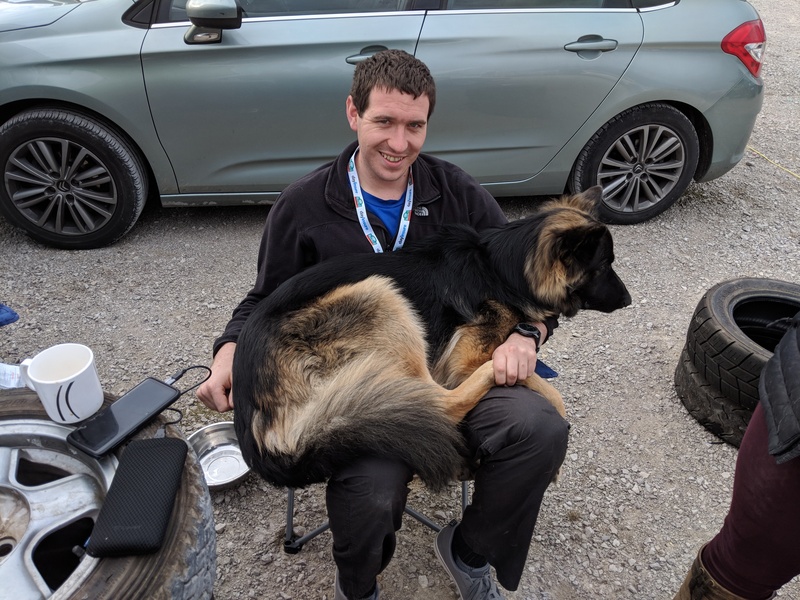 It took around 3 minutes to change the wheel and then to complicate things further when getting back in the car the intercom lead had got trapped in the door and got damaged. This meant that the last 8 miles were completed with Gordon being unable to hear the route notes. Lots of hand signals were required from Ian to ensure we got slowed down enough for the tight corners. Fortunately we made it unscathed and got to the end without any further problems. 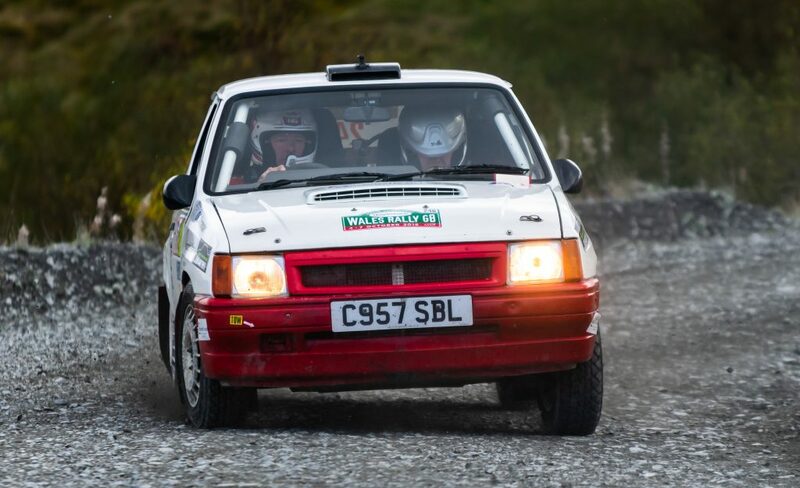 For the next stage in Penmachno we were able to switch to the spare intercom before the stage meaning that we were at least able to hear each other. The stage went very well, setting 25th quickest time. There was one small spin near some gates which was fairly close but fortunately just missed them and carried on. 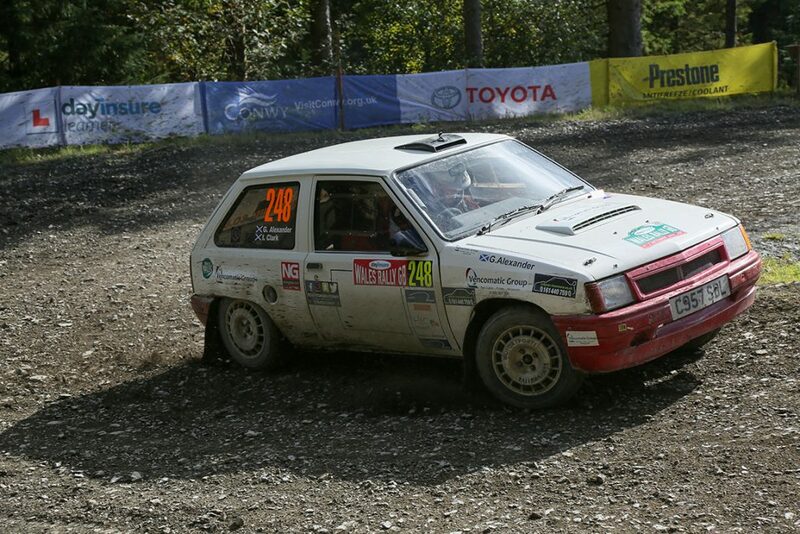 The last 2 stages were in slate mountain, a short spectator stage at a slate mine. The information before the event suggested it would be a bit rough so we were very cautious and didn’t take any chances. The fears were proved correct as there were huge ruts and also very large rocks on the road as well. The time for our first run through was fairly slow but it didn’t matter it would be a huge shame to break the car when the next day had some great stages. The last stage of the day was another run round slate mountain and we got stopped near the end as a Subaru had hit a rock and completely broken the suspension leaving the car in the middle of the road blocking the stage. We had to wait about 15 minutes for the car to be recovered and then we made our way back to the service area at Deeside. Once back we noticed we had been given a wrong time from the blocked stage at Slate Mountain putting us down the results. We submitted an inquiry and were told that it would be sorted out. Meanwhile David Alexander and Sam Black got to work checking the car over before the Saturday stages. The car had ran perfectly but the team found a few problems. There was a bent part on the front suspension and the nut had stripped meaning it was coming loose. That was replaced and re-tightened ok. Sam found that one of the back wheel bearings was in really bad condition and was concerned it wouldn’t make it to the end. Gordon was able to use his contacts from when he worked in Shropshire to get in touch with a company that did 24 hour call outs for supplying bearings and they confirmed they had one in stock. David and Ian set off for Shrewsbury to collect it. It was quite late when they returned so Sam fitted it in the morning once it was daylight again. 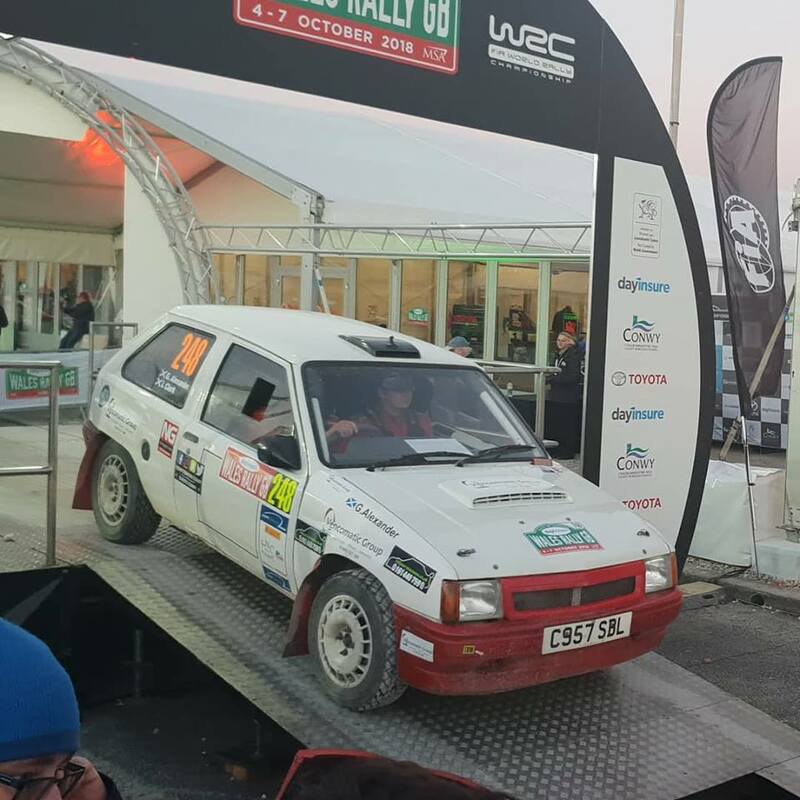 On Saturday morning the incorrect time from the last stage had not yet been corrected and we had been put at the back meaning we were running behind cars that were much slower than us. We asked the clerk of the course to look at it but he decided that there was no safety issue with us running with cars that we would about 3 minutes quicker than and were left to run at the back of the field. The first stage of the day was Myherin which was very wide and fast. Unfortunately in the first mile or so the car just slid off the road and the car got beached on the sump guard. There were a few spectators at the corner but they couldn’t push it back onto the road. We got out and attached the tow rope to the back of the car and we were able to pull it out back onto the road. Unfortunately around 3 and half minutes had been lost. However we got going again and caught and passed the 3 cars that had gone past us while we were stuck. We carry a GPS speedometer in the car and this was the fastest stage of the weekend reaching 91 mph. The next stage was Sweet Lamb. We had a very clear run through here with no real dramas. We caught the 2 cars running in front of us but they were really good and moved out of the way straight away. 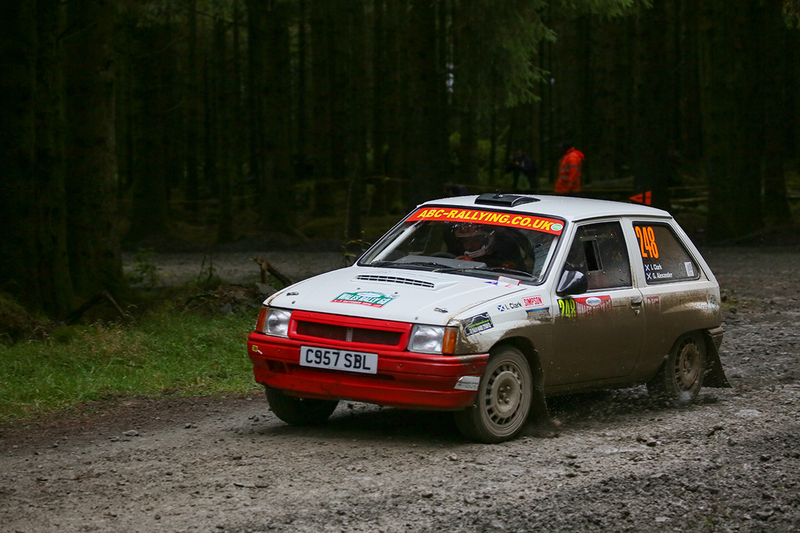 The next stage was Dyfi, another classic Welsh forest stage. This one again went fine and we caught a couple of cars but no problems to speak of. Only 2 stages to go and the next one was Gartheiniog across the road from Dyfi. It was a bit looser in here but we had another clean run. 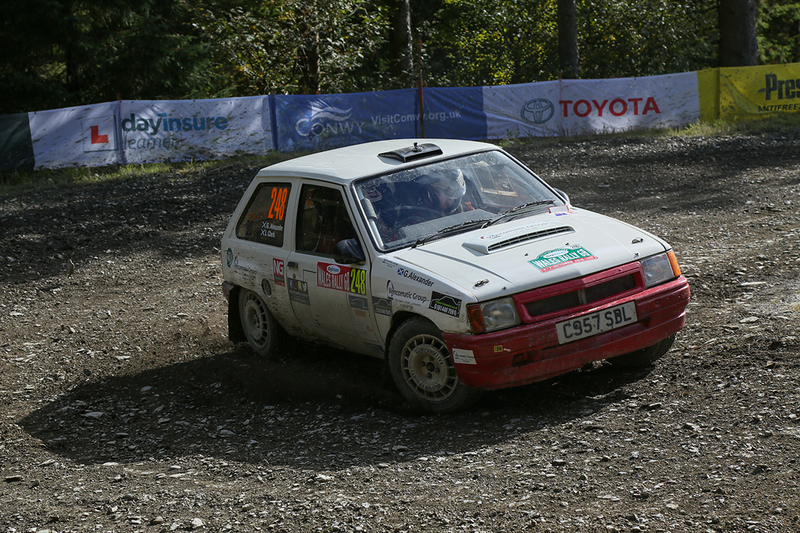 The last stage of the rally was Dyfnant and was only 5 miles long. We didn’t take any risks but had a good run and set the 20th quickest time through here. We then had a 2 hour road section back to Deeside to complete the rally. When we got back to Deeside we were showing as having a 3 minute time penalty. We queried this and it got removed as it was a mistake. We made it over the finish ramp to finish 30th overall and 5th in class. And that was it over for another year. 30th overall was a good result and the stages were really good. A huge thanks to everyone that helped especially David and Sam for servicing. Thanks to Alan and Mark at ProTec for slotting us in and making the time to get the car running properly. Thanks to Anthony for the loan of an intercom for Saturday after we broke the cable on Friday.